We are so blessed to live here in the northwoods of Maine and doubly blessed because we have family really close. Our Uncle lives next door and my inlaws live about 1/4 mile down the road. There is nothing better than family. Uncle Ken who lives next door celebrated his 88th birthday on Monday. He is one of the most intelligent and gentle men that I know. I have only had the privilege of knowing him for the last 30 years or so but my husband has spent his whole life learning from this man. Uncle Ken is by education and career a Structural Engineer but he taught my husband so much more. How to work on and repair vehicles (when you could still do that in the back yard or your own garage), taking and developing photographs (long before digital), construction and building and so many other things. The most important being to love the Lord. For me he has been a great help in all the building projects around the homestead. Anytime that I get an idea in my head I always run it by him to see if what I have conceptualized it doable and won't fall down the way I plan on doing it. I have also had a fine example of a Christian man to watch every day. For our son he has also been a great influence and he has been collaborating with Uncle Ken on a book of sorts on politics and war. Uncle Ken having been born in 1928 has seen a lot of this world's history first hand and our son it very interested in history. Just a few days after his 88th birthday Uncle Ken had a stroke. He is recovering very well but the event seems to bring a lot of things into focus. The biggest being how empty all our lives would be without him. Although he is more than ready to go home to glory to be with his Lord and Savior those of us who would be left behind would still hurt. The Lord chose not to take Uncle Ken home at this time so it is our duty, my duty, to continue to glean from this wonderful man. And to realize each and every day how much we are blessed by him. And for him to know this from us. My wish is that you also have a Uncle Ken, or several, in your life. Let them know how much they mean to you and cherish what you have learned from them. So many of the old ways are being forgotten, preserve what you have learned and pass it on to the next generation. At this point I've been informed Uncle Ken is back on his downhill slide and it seems he may not come back this time. Times are going to be difficult for our family for a while as we prepare to see him go then have to come to terms with his absence. While he is not gone from us quite yet, I thought now is the time to express how I have seen the building of his legacy. 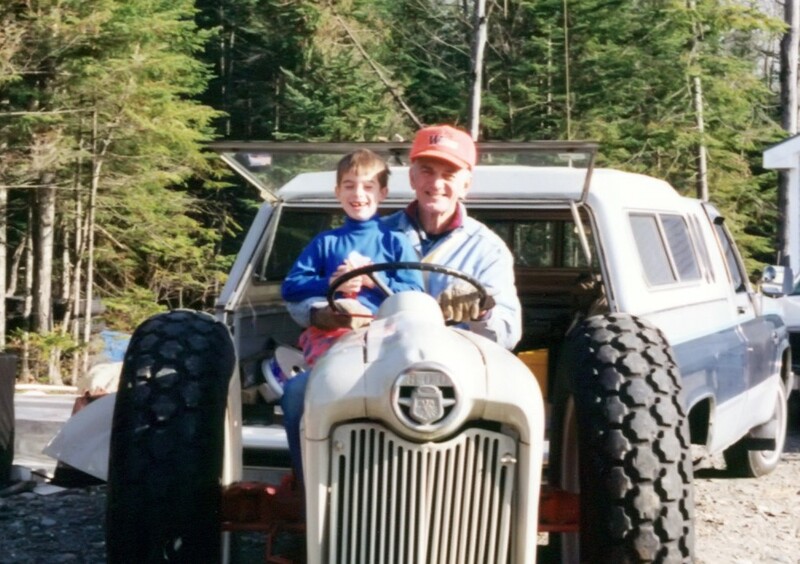 Even though I'm still not as suitable for the backwoods lifestyle as my parents, I still had a wonderful upbringing in Maine and Uncle Ken was a large part of that. Whenever anyone's asked I would call him my "mentor" for lack of a better term, but the truth is he's been as much family as anyone related by blood. With no household of his own, he came in to the Knightlys, became a life advisor to my grandparents and had a hand in raising my dad, my uncle, me, and my 3 cousins. I've often wondered how many families out there are so blessed to have such a person in their lives. When I was young, I didn't know any other way because Uncle Ken was always there when we needed him. After growing up and understanding not everyone has such a loving guide in their lives, I feel I cannot express the extent of how thankful we all are to have had him. Of course we know once his pain is over he'll meet his Savior, something he's waited on a much longer than he probably expected. In the meantime we'll miss him, but we'll also carry on and honor the legacy he's left in all our lives. I will say it's my hope that if I cannot be blessed with a wife and family of my own, I'll find a household to adopt and try to do the same for them as Uncle Ken has done for us. Speaking of leaving a legacy, that is the very purpose of the book we've collaborated on together. I first came up with the idea about 4 years ago and probably could have had it finished by now if only I'd been able to find the right work-life balance, but it will still be here even if he's not. Uncle Ken instilled in me a love of both God and country, and while by his own admission he's not much of a writer, he's lived through history and I wanted to preserve his perspective. I don't have a title for this project yet, but the core content and chapter structure for the thoughts he contributed (up through the 1970s) is just about done. I have the notes he tapped out on his electric typewriter, including his salvation testimony that tells part of the story leading up to how he became a part of our family, plus his brief time in the army (he'd have fought with the invasion force if Japan hadn't been nuked and WWII stretched into 1946; his unit was nearly deployed to Korea, but his CO was able to pull strings and get them turned around at the last minute). Sooner or later everyone comes to this sort of crossroad in life, and it should make us appreciate not just the blessings we've had but also the legacy we carry on. The scriptures tell us love is the greatest force for good, and I can personally vouch that it has shown. Any day now Uncle Ken will meet Christ, and be able to thank Him face-to-face for having lived with the Knightly family.